Relaxing grey summer clouds is hanging over The Cabin, It's time for yet another day by the grinding wheel. I have a bunch of knives and other edge tools in need of sharpening. So I turn on The Kiruna Grinder and let the slow rotating stone set the pace of the day. I want to take the opportunity to share my thoughts on edge tool sharpening and then show a movie of me by the grinding wheel. What profile to pick depends on tasks at hand an taste. Personally I often prefer a Scandi grind knife (single edged, V shaped) as I often use my knives for whittling. Double edged profiles (Compound edges) like the Flat grind or the Hollow grind works nice as game knives when hunting. These Compound edges are also the most common edge profiles found looking internationally. The Convex edge is more and more being used also on knives (not just on axes). One example of this are the Fällkniven knives. The above four symmetric edge profiles are the most common recognized, but there are many different ways to shape an edge. The most important feature of an edge tool is the hand holding it an the mind behind it. 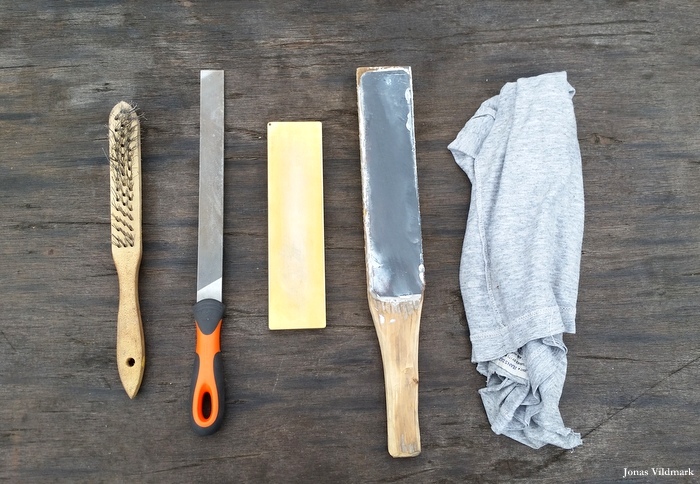 When I sharpening an edge tool I use four different steps; 1-Shaping the edge, 2-Grinding the edge 3-Honing the edge and 4-Polish the edge. Which steps used depends on the condition of the edge and what I'm planing to do with the tool. If the edge are hurt by nicks or waves I use a single cut steel file to regain the edge symmetry. The hand file is a pleasant way of getting to know ones edge tool and at the same time avoiding damaging the heat treatment of the edge using a high speed electrical grinder. When having a large amount of edge tools to sharpen I often use my slow rotating electrical grinding wheel. Otherwise I also like using bench stones. I categorize the stones into four groups; Natural sand stones, Artificial sand stones, Diamond stones and Ceramic stones. Some need oil or water and some don't. But usually I prefer using water to get the right feel and response while sharpening and at the same time getting rid of the metal leaving the edge. When grinding I like to use the 800 grit diamond side of the Fällkniven DC521. Usually I'm sharpening by free hands (no guide) feeling confident on the tools edge bevel angle. But If I what to check the angle I use a measuring tool. Very roughly speaking; and angle of 20° is suitable for wood carving and a angle of 40° works good on a hunting knife. There are a lot of different sharpening tools and systems out there, Spydercos Triangle Sharpmaker is one example. My advice to you is to try them and decide which tools and methods works best for you. In the next step I use the 14 000 grit ceramic side of the DC521 stone. Honing is pretty much the same technique as grinding just using a finer surfaced stone. Now and then I check the edge spine by looking straight at it. If light reflect from the edge ridge then I need to continue in that area. Always nice to have a fresh edge ready to take on new tasks. This day got to be a really nice one. When I finally turn of my grinding wheel it all gets quiet and I lift my hat of to my old buddy; the grindng wheel. 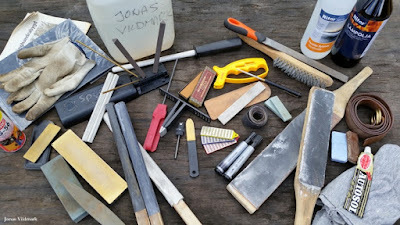 You can also see a piece I've written at Bushcraft Store focusing on sharpening a knife using a bench stone, click HERE. Also take a look at maintenance by clicking HERE.